" One day, we give fire training to 50 students and so on. That means we will do it toward 150 students for three days"
North Jakarta Fire Handling and Rescue Sub-dept. 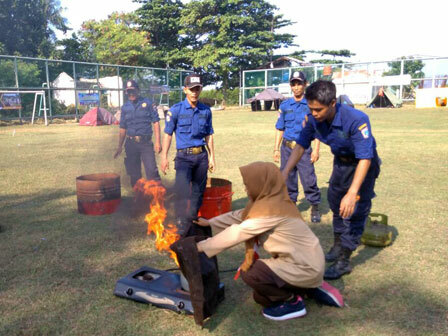 is giving fire training to students of junior high school (SMP) in Pramuka Island, Panggang Island Urban Village, Utara Seribu Islands. Satriadi Gunawan, Head of North Jakarta Fire Handling and Rescue Sub-dept. said it would be held three days. It has been ongoing since Friday (8/11) until Sunday (8/13). Various fire fighting skills and practice materials are provided. "One day, we give fire training to 50 students and so on. That means we will do it toward 150 students for three days," he stated, Friday (8/12). He added participants are taught how to handle the flames using wet sacks and how to use portable fire extinguisher tools and portable pumps. "Hopefully, those can also share their fire knowledge to their family and friends," he finished.